Power systems must be actively managed to maintain a steady balance between supply and demand. This is already a complex task as demand varies continually. But what happens when supply becomes more variable and less certain, as with some renewable sources of electricity like wind and solar PV that fluctuate with the weather? To what extent can the resources that help power systems cope with the challenge of variability in demand also be applied to variability of supply? How large are these resources? And what share of electricity supply from variable renewables can they make possible?There is no one-size-fits-all answer. The ways electricity is produced, transported and consumed around the world exhibit great diversity. Grids can cross borders, requiring co-ordinated international policy, or can be distinct within a single country or region. And whether found in dispatchable power plants, storage facilities, interconnections for trade or on the demand side, the flexible resource that ensures the provision of reliable power in the face of uncertainty likewise differs enormously. 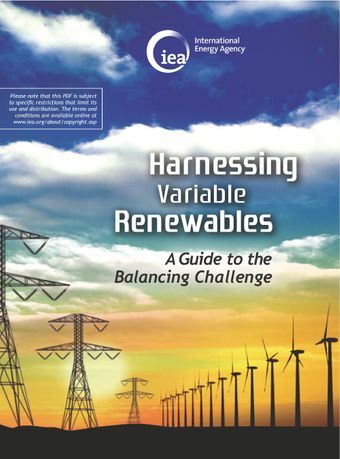 Written for decision makers, Harnessing Variable Renewables: a Guide to the Balancing Challenge sheds light on managing power systems with large shares of variable renewables. It presents a new, step-by-step approach developed by the IEA to assess the flexibility of power systems, which identifies the already present resources that could help meet the twin challenges of variability and uncertainty.